Alright, you want the bad news first, right? Come on, no one ever wants the good news first. So sit back in your chair and maybe do a little shoulder stretch, because you’re going to have to get through the sad one one to get to the heart-warming one. Them’s the rules. Perhaps you’d heard about last week’s fatal shooting at a Huntsville, Alabama Taco Bell in which assistant manager Shawn Bone was killed by another employee. This week, a former manager at that location has spoken out, saying the restaurant’s management knew employees were bringing guns to work but did nothing about it. Steve Mason, the former manager, told news station WAFF his supervisor “wasn’t doing anything about toting guns in there. 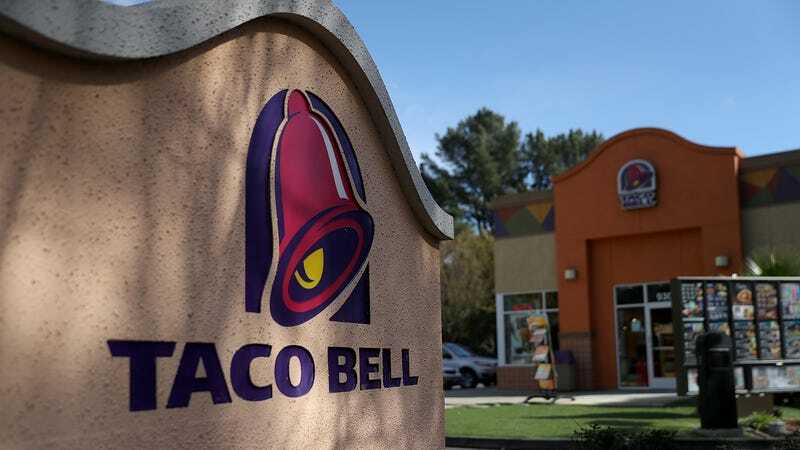 I felt unsafe in there, and now this has happened.” He says he brought the issue of guns in the workplace to his supervisor at least three times but claims he was told the Taco Bell location couldn’t afford to fire anyone. Mason asserts the supervisor was more concerned about staff turnover rates, which could affect bonuses, than the safety issues he raised. He says his supervisor continues to be employed by Taco Bell. That location’s Taco Bell franchisee doesn’t directly deny Mason’s claims in a statement to WAFF, but says that Taco Bell and the franchise company have a “zero-tolerance policy” for firearms in the workplace and that this tragic shooting was a violation of that policy. The franchise says it has offered to pay all of Bone’s funeral expenses and has offered employees counseling. Okay, you made it through that sad news, and you are rewarded with this delightful tale about a mama duck nesting outside a Taco Bell drive-thru in Winchester, Virginia. According to the Winchester Star, ducks have nested in the rocky landscaped area along a Taco Bell drive-thru for the past four years; this year is no exception, as a mama mallard has taken up residence there for the past month or so. Employees report the duck doesn’t seem fazed by the stream of traffic, and that some customers have come to expect the duck’s presence. Assistant manager Amanda Grady reports the staff provides the duck with fresh water every day and sometimes feed her some lettuce or tomatoes (not Nacho Fries). They anticipate her eggs will hatch soon, at which point we can only hope for an adorable Make Way For Ducklings-type tableau across the drive-thru lane. The duck is reportedly named Ethel.